Okay so it's Saturday. Haircut at 9am. Over my Dad's after that. Grocery shopping with him and then lunch afterwards. Lunch consisted of an eggplant Parmesan (made by me) and roasted peppers (made by my dad, and they were great) sandwiches. After that I had to get going, still needed to make one more stop and then home to try to catch up with an online class I thought I would have time for (when will I learn... no pun intended). Anyway this is a long explanation as to why I used a jarred sauce for dinner. I felt so bad about it that I decided to make a salad in addition to the pasta. But what jarred sauce did I use... Silver Palate Vodka Sauce. Why that brand? Their cookbook was one of the first I purchased, and I received The New Basics as a shower gift. And it was on sale. We both loved the sauce. 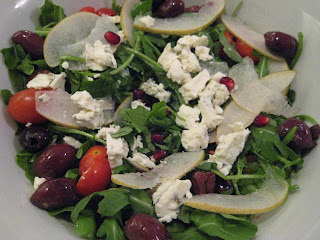 And the salad consisted of arugula, tomato, olive, Asian pear, Gorgonzola and pomegranate seeds.